Bathukamma this year 2014 starts on Monday 22nd Septemberber and ends on Thrusday 2nd October. Bathukamma according to Lunar Calendar it falls in Ashvin or Aswiyuja Masam. Bathukamma festival falls according to English Calendar in September–October month. Bathukamma is a nine days festival. Bathukamma festival is celebrated by the Hindu women and it is a Telangana festival that is celebrated during the Navaratri. 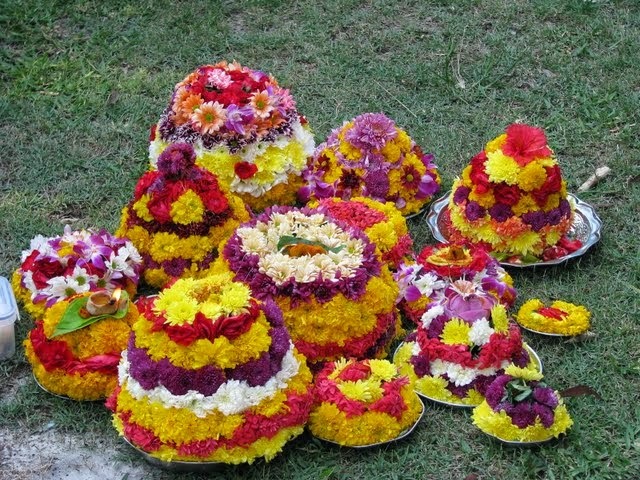 Bathukamma festival is unique identity of Telangana for its culture. Bathukamma starts on the day of Mahalaya Amavasya and ends on Aswiyuja Navami. Bathukamma ends one or two days Before Vijayadasami/Dushera. This is a nine day long festival that ends on Durgashtami and is called as Saddula Bathukamma or Pedda Bathukamma. The festival is mainly observed by women and is dedicated to Goddess Bathukamma who is an incarnation of Goddess Sati. Bathukamma means (Bathuku and Amma) Bathuku means live/life, and Amma means mother. Bathukamma is celebrated for the glory of people. Later it is dedicated to goddess Gowri/Gouri celebrated in the form of Bathukamma. Women's start preparing Bathukamma from the afternoon. Local seasonal flowers mainly tangedi, gunuka, alli, katla and more. They cut the flowers leaving the little length base, some dip in colours, some scented and arrange them on a wide plate called tambalamu, and stack them up in a conical mount, like a cone. The flowers arranged in five, seven and more concentric columns and rows decorated with a pumpkin flower on top of the stack. In the evening Women and young girls celebrate the festival dressed up in traditional pattu saris, half Saris and Dresses and wear jewellery. And gather in large numbers with their Bathukamma in their locality, place them in the middle and clap, Sing and dance around them in small circles. After singing and dancing around for hours, Bathukamma are taken to a lake or a pond then set afloat in the water. On the last day of Bathukamma women also prepare different varieties of food mainly pulihora, daddojanam and Maleeda along with Bathukamma after singing and dancing near the pond they will share the food with each other and leave the place with joy and happiness. Bathukamma festival gives the importance of the relationship between human beings. One of the most important Bathkamma Panduga rituals is held at the Bhadrakali Temple in Warangal.